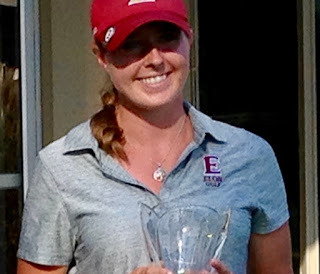 Heather Munro (pictured left) from Monifieth, a student at Elon University, North Carolina, achieved her fifth top five finish on the United States women's college golf circuit at Blue Hill Country Club, Canton, Massachusetts when she was placed second at the Boston College Intercollegiate (September 25). -- It matched her highest ever final placing in American. Munro, who had scores of 73, 71 and 74 for a two-over-par total of 218, one stroke behind the winner, Elsa Dax (Richmond University), was five-over at the turn in her final round before she birdied three of her final five holes. Over the 54 holes, the Scotland international team player carded 10 birdies Elon University finished sixth of the 16 teams behind title winners Richmond.